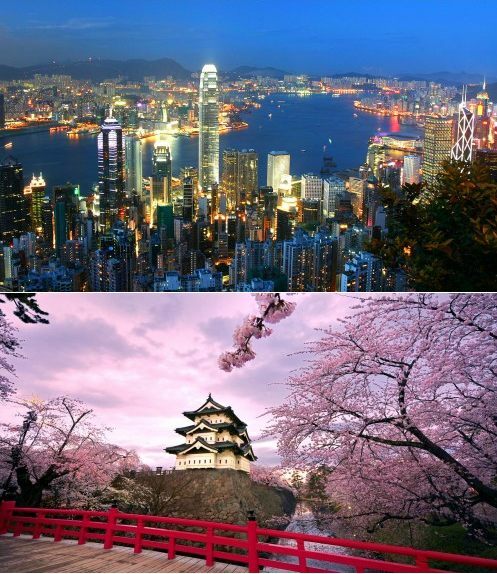 A multi-city flight deal that allows you to visit both Hong Kong and Tokyo, Japan (spending time in both destinations) from Toronto, for just $748 CAD roundtrip including taxes. It's also currently possible to find roundtrip fares from Toronto to just Hong Kong alone for $648 CAD roundtrip including taxes. Toronto to Tokyo, Japan on it's own is around $1076 CAD. 3. Choose dates from the list above. toronto, yyz, flight deals, asia, tokyo, japan, nrt, east asia, hong kong, hkg, united airlines, ana and all nippon airways. 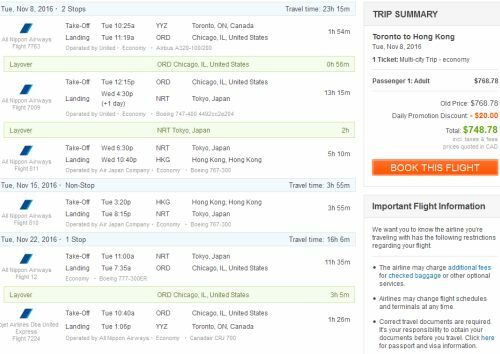 2 Responses to "2 in 1 trip: Toronto to Hong Kong AND Tokyo, Japan - $748 CAD roundtrip including taxes"
Looks like prices are up to 949 now :( -- let us know if this goes on sale again? Ah man I need an Indonesia + Japan one!